As the final piece of her 25th anniversary, DJ Isis is now presenting her new project ‘Isis & Mozes’ to the world. Their debut EP ‘OSTARA’ is released April 12th, 2018 at KROOKS Records. OSTARA is the outcome of an intensive collaboration with her new studio partner Mozes. 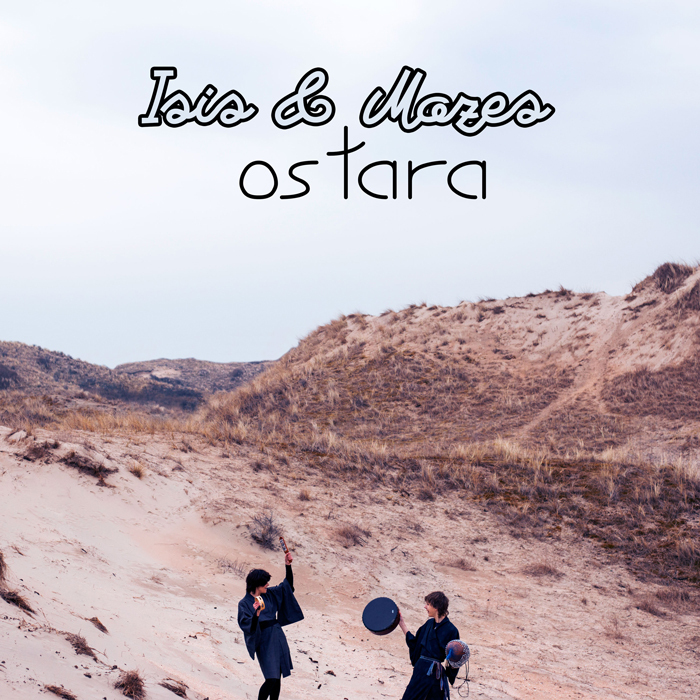 On OSTARA, Isis & Mozes worked with different musicians, instrumentalists, and vocalists. These are the key ingredients that formed the basis for the compositions made by Isis & Mozes. In addition to the electronic parts of the compositions, Isis & Mozes used different types of instruments featuring Mozes on guitar and Isis on vocals. Besides their own compositions, one of the tracks on OSTARA is produced in collaboration with colleague-producer and dj: Trippin Jaguar. In addition, the producers-trio Yør Kultura made a hefty remix of their track Aerial for the EP. Hang & Assorted Percussion, Joshua Samson. Vocals, Laura Sestri, Assorted instruments, Lerant. The artist village Ruigoord is an important location and inspiration for the EP. We first met in Ruigoord and often play music in the Church as well as at the festivals. It’s an important place within the borders of Amsterdam where many artists and musicians perform such as Yør Kultura, Trippin’ Jaguar, and My Baby. When Moos’ dad dove into Smid & Smid studios for a new musical project, he took Moos with him. The studio engineer connected with Moos and after hearing some tracks, he decided to take him under his wings and became a mentor for him. Having just finished My Baby’s second album, he gave Moos the stems of some tracks. When Moos returned with some dubbed out psychedelic remixes, the band really loved his work. It’s been a deciding factor in the direction the band took after that and so he became a co-producer of the third album, recorded at Electric Monkey studios. For this track the guitar parts that Mozes played added a very rock ’n roll, dusty desert vibe, and just like the desert we tried to keep the overall sound open, wide, mystic and minimalistic. I get really inspired by field recordings and recording acoustic instruments. You get this organic and raw open sound, and there may be a lot of interesting surprises in your recordings like pops, clicks and noise that I like to use to create unconventional grooves. As for minimalism, every sound really has its own role and plays its own part in the bigger picture of the song. Together all the elements weave into a mysterious storyline free for interpretation by the listener. The first time we met DJ Isis was at our first gig ever in the church of Ruigoord. We later heard this church has been a central point in the musical career of Isis, which makes this location extra special. Soon after we decided to work together on some music, which resulted in us doing this remix for her. During our music process, we get a lot of inspiration from different kinds of artists from different genres. Depending on the moment, weather and time of the day we listen to different kinds of music. Our musical influences are constantly evolving, which we believe keeps our sound dynamic. The inspiration of the remix is coming from a lot of desert dust, late studio nights, sushi takeaway and of course a good sound system. We tried creating a track that gives a warm cosmic vibe and keeps on going. It starts a bit off slow and spacey but keeps building throughout the track.